Saturday morning Kathie and I visited a very fine prairie remnant in eastern Iowa County. This site, on private land, is being managed by the Prairie Enthusiasts. It is a small remnant, but very high quality. During our brief one-hour visit we counted 44 species, including most of the "signature" prairie species (compass plant, lead plant, etc.). There was also a nice population of rough false foxglove (Agalinis aspera; see photo). According to Cochrane and Iltis (Atlas of Wisconsin Prairie and Savanna Plants), this is a hemiparasitic annual characteristic of dry prairie sites. This species is also present at Black Earth Rettenmund Prairie, but in much smaller numbers. At the Iowa County site plants were blooming all over. There is also supposed to be the really rare Agalinis skinneriana at this site. We looked carefully for this tiny gem, but unfortunately did not find it. Possibly we were too early, as these false foxgloves generally flower late. However, since they are annuals, there year-to-year success depends on them setting viable seed. This site was discovered about ten years ago by a prairie enthusiast who was able to get permission from the landowner to carry out restoration work. Burning and weed control have brought about wonders. In fact, sweet clover, the usual bane of dry prairie remnants that have been burned, is virtually absent here, an impressive accomplishment. This site also has a nice small bur oak savanna (seen at the left in the top photo). Among other things, this savanna is interesting because it is down in the valley rather than at the top of the ridge where most bur oak savannas in southern Wisconsin are found. However, in presettlement times, bur oaks were actually a major component of the lowland savannas. Now they are rare in this situation, probably because they were convenient trees to cut during early settlement activities. Those on the ridge tops were hard to log, especially with primitive equipment, and remained. Another interesting plant at this prairie was a tall, vigorously blooming plant of prairie dock (Silphium terebinthinaceum), which, according to Cochrane and Iltis, prefers wet-mesic prairies. The present site is as dry as they come, which makes one wonder what it is doing here (and how it got there). We also have some vigorously flowering prairie dock plants on dry savanna sites at Pleasant Valley Conservancy, making one wonder about the fidelity of this species. In an earlier post I stated that we had only three species of the genus Desmodium at Pleasant Valley Conservancy. 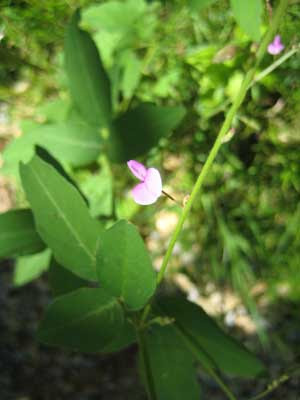 Since then we have found a fourth, D. paniculatum, panicled trefoil (see photo). Cochrane and Iltis, in the Atlas of Wisconsin Prairie and Savanna Flora, call this plant D. perplexum, but the U.W. 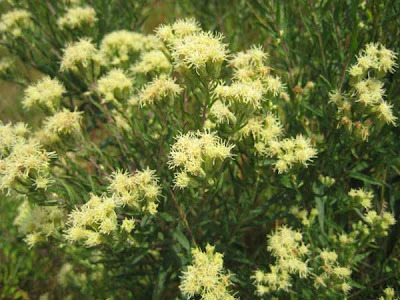 Herbarium uses paniculatum. Once we recognized this species, we were able to find it at other places at Pleasant Valley Conservancy, some with fairly large patches. Today, we collected quite a bit of seed of this species and plan to plant it in other parts of the savannas. The fact that Pruka found this species here even before we had begun restoration is interesting. This species thus joins the 170 others that had managed to survive years of deterioration of the vegetation. How many more species are here but have not yet been recognized? At the Grassland Research Network meeting today I learned that a number of prairie restoration projects in various states are using the Floristic Quality Index value as a measure of the success of a restoration. To calculate FQI, one needs to know the number and name of all the species in a prairie, and the Coefficient of Conservatism (C) of each. The C value is given to each native species on a state-wide basis. Each species is assigned a value from 0 to 10, that represents the probability that this plant species is likely to occur in landscapes relatively unaltered from those of presettlement times. Plant species with relatively specialized requirements are given higher C values, reflecting the fact that they are found in more restricted habitats. The FQI is then calculated by multiplying the average C for the site by the square root of the number of species present at that site. According to some researchers, an FQI greater than 50 represents an area of high conservatism and an area with an FQI greater than 35 is considered floristically important in the state. The FQI value for Pleasant Valley Conservancy as a whole unit was found to be 91.5. The concepts of FQI and C were created by Swink and Wilhelm, from the Morton Arboretum in Chicago, and can be found in their widely used book: "Plants of the Chicago Region." Details of C and FQI for Pleasant Valley Conservancy can be found elsewhere in this web site. Frankly, I can see considerable limitations in FQI. It may have value in comparing successes of restorations in a local area, but comparing FQIs across distant geographic areas is probably inadvisable. Among other things, the assignment of a C value to each species is a subjective exercise. However, FQI might be used to justify restoration work on a particular prairie remnant. Those of low FQI may be so degraded as to be too costly to restore, whereas those with higher values might be worth investing time and money. However, experienced restorationists might be able to make such a decision simply by walking a site. This week Kathie and I are attending a meeting of the Grassland Research Network at the U.W. Madison Arboretum. Folks at this meeting are from various Midwest states plus a number of local practitioners. 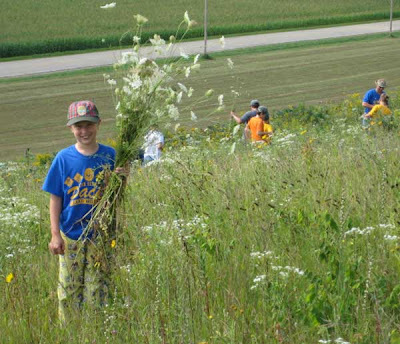 All are involved in planting or maintaining prairies. Many of the people are from Nature Conservancy offices in various states. The meeting is focusing on "Lessons Learned" from past efforts at prairie planting. The location at the Arboretum is appropriate since this organization has the two oldest restored prairies in the U.S., the Curtis and Greene Prairies (which we visited). At Pleasant Valley Conservancy, Kathie and I led the participants through two of our oldest prairie restorations (Pocket and Toby's), then to a recent restoration (Ridge Prairie), and finally to our East Basin restoration, which has been cleared but not yet planted (expected planting is in November of this year). We also gave the attendants a brief idea of our savanna restorations, and ended with a walk along our south-facing slope, where they were able to see our work restoring some large prairie remnants. This meeting is being very valuable to us, and the questions we are getting from the participants give us considerable insight into what we are doing right (or wrong). We are also enjoying meeting people from other states and learning of their restoration successes. Yesterday Ted Cochrane (in the middle in the above photo) from the U.W. Herbarium led a very informative field trip to two sand prairies in Sauk County, Schluckebier and Gasser. These prairies are owned by the Nature Conservancy but managed for them by the Prairie Enthusiasts. Sand prairies have an interesting suite of plant species, some also common to other dry prairies and some unique to sand. Schluckebier has the more "normal" prairie flora than Gasser, with lots of rough blazing star in bloom, among other things. At the nearby Gasser Sand Prairie we saw two species that are less common. The one to the left is fame flower (Phemeranthus rugospermus), a member of the purslane family (Portulaceae). This rare species is usually found on the driest sandy soil. Its tiny blossoms only open in the afternoon for about 3 hours and then fade. Our timing was great, as there were quite a few flowers showing during our late afternoon visit. In Wisconsin it is found almost exclusively in the western and southern parts of the state, its distribution almost tracing the boundaries of the Driftless Area. This is a State-listed species (Special concern). 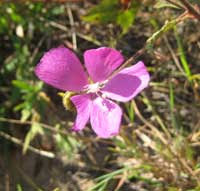 The other species is poppy mallow (Callirhoe triangulata), another Special Concern plant. This rare, showy, sand prairie species is almost solely confined to the Upper Midwest. In Wisconsin it is mostly confined to the dry sandy valleys of the Wisconsin and Mississippi Rivers. (The sand from Gasser Prairie derives from a high water phase of the Wisconsin River during the retreat of the last glacial period.) I have only seen it during field trips to southwest Wisconsin and northwest Illinois. It is always a treat to see it. According to various gardening web sites, both of these species can be raised in open flower beds, and seeds can be purchased. Because of their rarity, seeds should never be collected from nature. 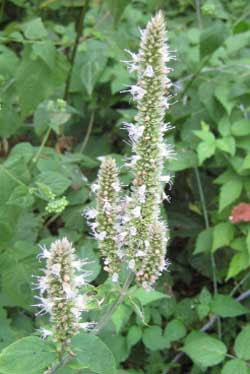 This is the time when the hyssops are in full bloom. We have two species at Pleasant Valley Conservancy, giant yellow hyssop (Agastache nepetoides; photo to the left), which is Threatened, and giant purple hyssop (Agastache scrophulariaefolia), which I guess is more common since it is not listed. Both are in the mint family and have similar flower characteristics. Ten years ago we started out with neither of these plants, but had good seed sources. The giant yellow thrived right away and we had it in most of our savannas, but especially in the upper bur oak savannas. For several years, we only had one or two plants of purple hyssop, but it has gradually spread, and now I think we have more purple than yellow. The area I found them in yesterday was an opening in a fairly wooded area. There is a knoll here due to a small outcrop of the Prairie du Chien dolomite, and it formerly had a lot of nasty burdock. (You know burdock, I'm sure. It makes these large burs that stick tight to your clothing.) We have been controlling the burdock here for five or six years, with the herbicide 2,4-D, and this year we must have gotten everything right, because it is now all gone and has been replaced by the two hyssops. The word "giant" in their common names is pretty accurate. They stand quite tall, and in fact I could see this patch from a long way off, and plowed my way through all the tick trefoil so that I could take these photos. Actually, my photos don't do justice to the size of these plants, because they are so large that they are hard to photograph well. I decided to focus in on the flowers, themselves. As the photos show, these aren't the showiest plants in the savanna. The colors are subdued, and I hardly think "purple" is the correct word for this one. Perhaps lavender would be better? In a recent post I described "trapping" three turkey poults while mowing a fire break. Today, I trapped a young pheasant in the same fire break with my Kawasaki Mule. It refused to go into the prairie and just kept scooting along the fire break ahead of the machine. These young birds really have an aversion to tallgrass prairie! Ten years ago we never saw or hear pheasants at Pleasant Valley Conservancy. Now we hear them all the time. I wondered about this until I discovered that a neighbor about a mile away has been buying pheasants and putting them out on his land. Obviously, they don't stay put. We had small populations of most of these even before we started restoration, and by collecting seed and spreading in newly restored areas we have obtained much larger populations. Two that we did not have, pale Indian plantain and woodland thistle, are now growing. Pale Indian plantain is thriving all over the savanna areas, as well as in the mesic and wet-mesic areas of our planted prairies. We also have woodland thistle growing, but since it is a biennial, it is taking us longer to get thriving populations. As readers already know, we have some pretty good native populations of purple milkweed (Endangered in Wisconsin), which have responded well to savanna restoration. Wild hyacinth (also Endangered here), is still missing and is going to be one of our targets in the next several years. Although fairly restricted in Wisconsin, at one time there were some reasonable roadside populations of this species, and a commercial seed source is available. We'll see! I'm not sure who came up with this species list. Several species listed are fairly common and may be on the list mainly because they are savanna "indicator" species. Horse gentian, New Jersey tea, elm-leafed goldenrod, and silky rye are pretty common, and I have seen sites that have very large amounts of upland boneset. Yesterday I spent some time chasing down some turkey poults while mowing the Valley Prairie fire break. (The photo above is the best I could do with my pocket camera while driving the tractor.) They liked the mowed lane a lot better than the tallgrass prairie, and refused to go off into the weeds. There were three of them, and they managed to keep ahead of the mower, but just barely. They are apparently still flightless. We have a lot of turkeys around (I flush adults often in the savannas), and we have been seeing "babies" for quite a while now, usually on the service road or the fire breaks. I trapped the three today when I brought in the Kubota tractor to mow the breaks. I felt bad about chasing them down the lane, but they refused to leave, and I had no way to turn around. Eventually I reached the end of the fire break where the vegetation was lower and they were able to scurry out of the way. It finally dried off enough so that I could finish mowing the fire breaks for the Valley, Barn, and Crane Prairies. All three of these prairies border the wetland, and the heavy rains earlier this summer had raised the water level in the marsh so that parts of the fire breaks were under water, or wet enough that the tractor sunk into the goo. I strongly recommend that visitors do this hike, since the wetland is very nice, with lots of diversity and plenty of wildlife. It runs about a half-mile parallel to Pleasant Valley Road and provides a nice loop trail back to the parking area at the Conservancy entrance. Cream gentian (Gentiana alba) is one of those great plants that we are now fortunate to have lots of at Pleasant Valley Conservancy. It is not common in Wisconsin and is State Threatened. It has a high Coefficient of Conservatism (7). 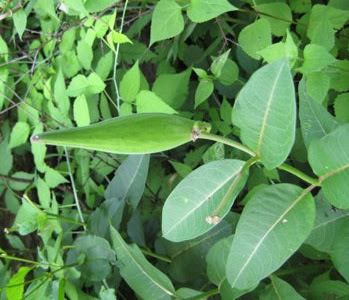 Originally, we had just a few plants lurking among the undergrowth in semi-wooded areas, but we had an alternate seed source and planted it widely. Where we now find it growing tells us quite a bit about its requirements. 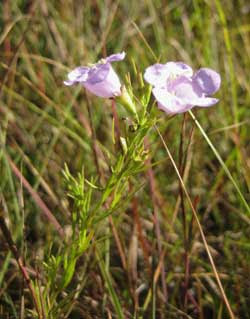 It has become very common in the savannas, and is also flourishing in the wet-mesic parts of the Valley Prairie. It isn't a tall plant, and can be easily missed if you are just walking the trails, but with a careful eye you can see it in lots of places. The photos here are from the White Oak Savanna (Unit 12A) where it has been doing very well for the past four or five years. In Wisconsin this species is found in scattered counties in the south and west, but according to Cochrane and Iltis, the abundance of known locations is deceptive, as this species has been over collected. The USDA distribution map shows it principally in the "prairie peninsula", with outliers in a few other states. It is considered endangered in Kentucky and Michigan, rare in Indiana, and extirpated (a gruesome term) in Pennsylvania. 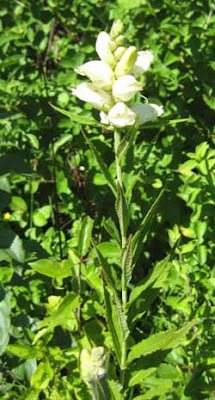 There is a related species, bottle or closed gentian (Gentiana andrewsii), and in fact these two species are known to hybridize. 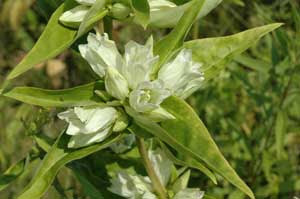 We have this gentian also, introduced from a Wisconsin seed source. 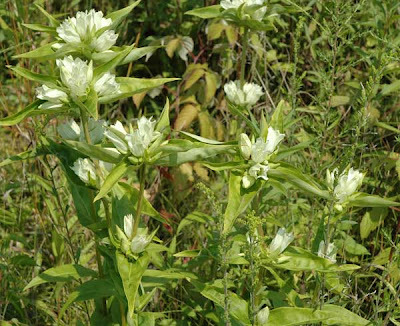 Although bottle gentian is generally blue or blueish, it also sometimes forms cream flowers which can be confused with those of cream gentian. However, the bottle gentian flowers remain closed at maturity, whereas cream gentian flowers open (as my photo here shows). How do bottle gentian flowers get pollinated if the flowers remain closed? Actually, the bees have no trouble pushing there way into the flowers. In our flower garden I have watched a bee completely disappear inside a bottle gentian flower and then reappear with presumably a good load of nectar (and pollen). Another gentian species that I wish we had is downy gentian (Gentiana puberulenta) which is a dry prairie species with stunning deep blue flowers. We have tried to grow this but the available seed source was defective. Our only other gentian at Pleasant Valley Conservancy, stiff gentian, although native to the property, is not very showy. It is called false boneset because it resembles to some extent tall boneset (Eupatorium altissimum). However, false boneset has alternate leaves whereas tall boneset has opposite leaves. Also, false boneset has tan-colored flowers whereas tall boneset has whitish flowers. An interesting fact is that the colors of the seeds of these two species are reversed. False boneset has grayish seeds whereas tall boneset has tan-colored seeds. False boneset is common on dry prairies, steep calcareous bluffs, and rocky to sandy prairie remnants. This is a strictly eastern or southern species, and reaches Wisconsin mainly on the southern and western part of the state, mostly in the Driftless Area. A minor fact is that the name Kuhnia comes from an Adam Kuhn, who brought the plant to Linnaeus from the Western Hemisphere. Biennial gaura (Gaura biennis) is a prairie plant which in Wisconsin is found mainly in the southern counties. It does not appear often on prairie planting lists, but is an interesting plant to observe in a prairie. As its name states, it has a biennial growth habit, although at times it may even grow as an annual. 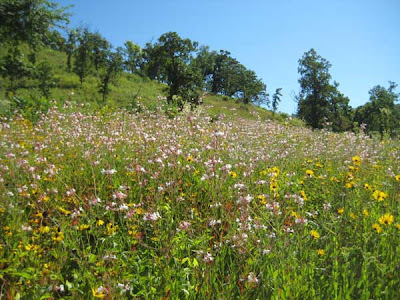 When we planted the Valley Prairie in November 2002, Kathie included a small amount of gaura seed in the planting mix. The second year after planting we saw two or three flowering plants, which did not return in subsequent years. Suddenly, this year, we had a surprise! Several really large patches of gaura showed up, in the somewhat drier part of the prairie (see photo above). From a distance they looked like some sort of reddish grass and only when getting near was it clear what we had. In contrast to our earlier gaura plants, which were very tall and lanky, the plants in these new patches were much shorter. Obviously, lots of seeds were lying in wait for the proper time to grow and bloom. This is almost certainly a transient phenomenon. Who knows whether we will see such patches in future years, or any gaura plants at all. A common name for this plant is bee blossom, and it is reported to be a favorite of bumble bees. I like the delicate and complex floral structure. This species is in the Evening Primrose family (Onagraceae), which has quite a few other biennial species (including Oenothera biennis). Cultivars include fuchsia and Lady's tear drops. It is hard to believe that the Sandhill Crane Wet Prairie is only in its third growing season. We have had so many successes here, including the best Indian grass we have ever had at this early stage. Of course, the weather has cooperated by providing abundant moisture. 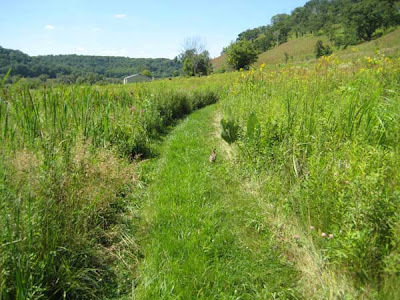 This prairie is a long narrow strip (about 3 acres) along the edge of the wetland, which provides a great groundwater source. Our decision five years ago to remove all the honeysuckle, walnuts, and other woody vegetation and plant it as a wet prairie is now paying off. And even the cranes seem to like it. The photo here is of turtle head (Chelone glabra), which we had in our native wet prairies even before we started restoration work. Also, the winter we planted the Crane Prairie (December 2005) we had especially good seed production in these native populations because earlier that year the U.S. Fish and Wildlife Service had conducted a major burn of the wetland property of five different landowners, of which we were one. Turtle head flowered especially prolifically that summer and we collected lots of seed. Now, in its third growing season, we are starting to see plants. 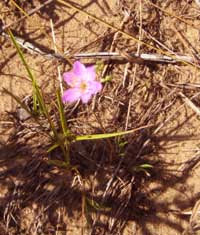 This species has a coefficient of conservatism of 7 and is listed as an obligate wetland plant. However, it is not that uncommon, and is listed in all 72 counties in Wisconsin. According to Cochrane and Iltis, this is a plant with considerable horticultural promise, and in a wet garden it could make a show from first flowering until frost. Blue vervain (Verbena hastata) is found principally in wet prairies but (interestingly enough) we also have it in our savannas. This is not uncommon, as many wet prairie species are found in the savannas, presumably because the dappled shade keeps the soil from drying out. It is a lot more common than turtle head, as shown by its coefficient of conservatism (3). 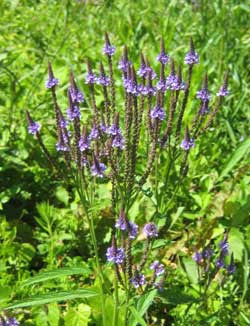 According to Cochrane and Iltis, this species hybridizes with white vervain (which is also present in the Crane Prairie) to create Englemann's vervain Verbena X Englemanii. The next species to be described which is blooming in the Crane Prairie is the real stunner. There are very few prairie species with legitimate red flowers, but you can't argue with the color of cardinal flowers (Lobelia cardinalis). According to Cochrane and Ilitis, this is one of the few species in the Wisconsin flora to be pollinated by Ruby Throated Hummingbirds. This species also has a Coefficient of 7. It is easy to see where cardinal flower got its name. Cardinal flower is often found together with great blue lobelia (Lobelia siphilitica) and we have them both together in the Crane Prairie. Both of these species are monocarpic, which means that they may grow for several (or many?) years in the vegetative state, but once they flower they die. In a rich habitat such as a garden they may turn themselves into annuals, flowering the first year after planting. Because of this monocarpic character, we never know where or when they will appear. Especially with blue lobelia, we have had huge populations one year to be followed by essentially no plants the following year. After a few off years, they may then reappear. Neither of these lobelias is an obligate wetland species, and we have found them in our savannas from time to time. 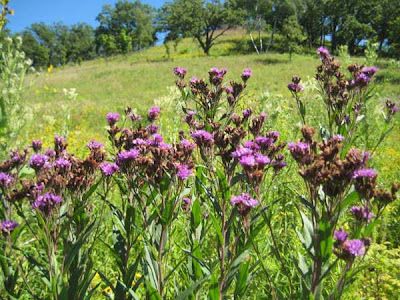 The final species to be mentioned here is ironweed (Vernonia fasciculata), which is also now in full flower. This species takes a little longer to get established and we don't have it yet in the Crane Prairie, although it is doing very well in the Barn and Valley Prairies (both wet prairies). The photo below was taken in the latter prairie. I'm not sure where its common name came from, but its flower color is distinctive. If you spot this color in the distance, even if hidden among many other species, you can almost be sure it is ironweed. Again, we have a native population of this species growing in one of our savannas. One of the joys of Pleasant Valley Conservancy is that we have a complete range of prairie habitats, from the very wettest in our marsh to the very driest on the south-facing slope. It is not often that you can stand at a little blue stem patch and throw a baseball into a wetland (not that I would every try this trick!). In fact, we have quite a bit of this moisture gradient in the Crane Prairie itself. Beginning at the marsh edge (where you can guarantee you will get your feet wet even in the driest summer), you can walk less than 500 feet to the road cut below Pleasant Valley Road, which is dry as dust. Today Kathie and I participated in a work party at Black Earth Rettenmund Prairie. The goal was to find the last sweet clover plants, those that had come up late or were too small to find at earlier work days. We also pulled Queen Anne's lace (wild carrot; Daucus carota). In addition to the Prairie Enthusiasts volunteers, we were joined by a troop of Boy Scouts from Lake Mills, Wisconsin that had camped overnight nearby and who wanted to help in our restoration efforts. With our regular volunteers and the Scouts, we had 25 people, a great group. We got a lot of work done, and sweet clover is now essentially finished at Black Earth Rettenmund Prairie. We plan to return for one more time the first Saturday of September, to get any stragglers. However, the main work at the September work party will be seed collecting. Sweet clover has kept us busy this summer, but we think we are seeing a possible end of this work in a few more years. Our goal, of course, is to exhaust the seed bank, and to remove any flowering plants that might set seed and reverse our work. We have already finished our sweet clover work at Pleasant Valley Conservancy, and are getting near the end of our Queen Anne's lace work. Just in time, because fall seed collecting is already upon us. This week Kathie and I went to Minnesota to attend the 21st North American Prairie Conference at Winona State University. This event, held every two years, brings together researchers and prairie enthusiasts from all over the Midwest (and a few from the south and the west coast) to share research results and make contacts. A major event at every Prairie Conference is a series of all day field trips at sites in the area. Since Winona is on the Mississippi River, with great scenic bluffs on all sides, the trips were very good. Kathie and I went on the trip to Great River Bluffs State Park, a 2000 acre preserve high above the river which has many fine dry bluff prairies. 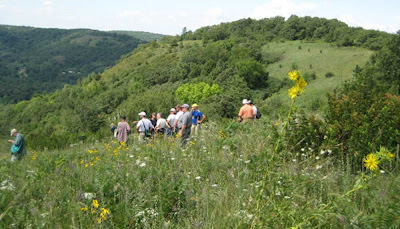 The photo below shows part of the group at King's Bluff Prairie, one of the largest and most pristine bluff prairies in the Park. The prairie had been burned in spring 2008 and had responded very well. Other bluff prairies can be seen in the background and across the valley. From the Mississippi River one can look across at the Wisconsin side where many more bluff prairies have been restored. The flora at King's Bluff Prairie was very diverse, and reminded us quite a bit of the prairie flora at Black Earth Rettenmund State Natural Area. However, the vegetation at King's Bluff was "lusher" than that at Black Earth, probably because the soil is deeper. We heard quite a few good papers at the meetings. Highlights were several papers on control of Canada thistle, sumac, and reed canary grass. Also, there were several good papers on work underway on high quality prairies and savannas. To me, two of the most interesting were from regions outside the Midwest (Willamette Valley in Oregon and Rice Lake Savanna in Ontario). 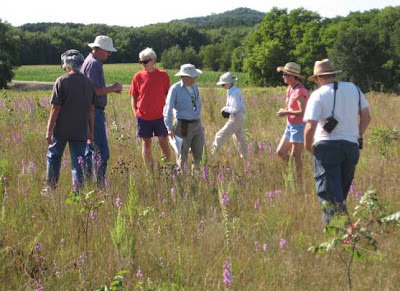 The next North American Prairie Conference will be in 2010 at the University of Northern Iowa in Cedar Rapids, IA under the sponsorship of the Tallgrass Prairie Center. We are just finishing our "sweet clover season." This species, Melilotus alba, is a real problem in prairie restoration, but rarely a problem elsewhere. 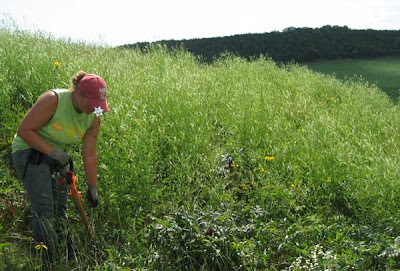 The photo here (by Matt Ziehr) shows a "wall of sweet clover" at Black Earth Rettenmund Prairie, with intern Emily just starting to attach it. Every prairie restoration activity that I know of in southern Wisconsin deals with it in a major way. At Black Earth Rettenmund we have spent about 150 paid hours dealing with this weed, in addition to some significant volunteer hours. Strangely, sweet clover does not appear as a significant problem on any of the Wisconsin lists of baddies. It does not appear on the recent list of noxious weeds that is making the rounds through the Wisconsin DNR as a runup to the new proposed noxious weed law. My written note at the public comment session last winter suggesting that it be added was ignored. 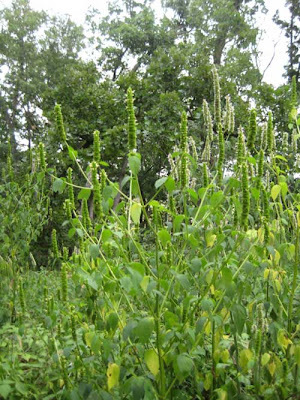 Why is sweet clover ignored when it is clearly such a major problem? First, it is an ag crop, and may still be planted commercially. But the main reason, I believe, is that sweet clover is unique in being stimulated by prescribed burns. Prairie people are the major burners, and a single good burn can bring out a major "wall of sweet clover." In the absence of burns, it hardly shows up. The reason for this is that the sweet clover seed is able to remain dormant for long periods of time, and is stimulated to germinate by fire. There has been significant research on the relation between fire and sweet clover, but anyone managing prairies could understand this even in the absence of careful field research. The encouraging thing here is that if one eventually flushes out all the dormant seeds, and keeps pulling all the new plants before they set seed, one should be able to eradicate this pest. At least that is our hope, and keeps us moving ahead on our control efforts. How long will sweet clover seed remain dormant in the soil? Some authorities say 30 years, but hopefully the major infestations will be greatly reduced in fewer years. We'll see. Rattlesnake plantain (Goodyera pubescens) is now in full bloom at Pleasant Valley Conservancy. This is probably the most common orchid in dry sites in southern Wisconsin woodlands. We have only a few populations of this orchid, widely separated, so it is a treat when it flowers. The specimen in the photo is actually very close to our woods road and if you know where to look you can see it without any effort. This population has been at this location ever since we started restoration work over 10 years ago. For several years it disappeared, and Kathie thought perhaps it did not like being burned. This year she carefully cleared around this population so that it would not be burned. This seems to have done the trick, as we now have more flowering stems than ever. The common name certainly derives from the "rattlesnake" like pattern of its leaves. The leaves are evergreen and the plant is often easier to find in a snowless winter than in the summer, when it is often crowded with other forbs. One winter when we were restoring one of our bur oak savannas we uncovered several patches that we had not known we had. The oak savanna habitat is characterized by an open canopy, ranging from about 10% to 50%. As part of my work on purple milkweeds, I was interested in measuring the canopy in the locations where they are growing. 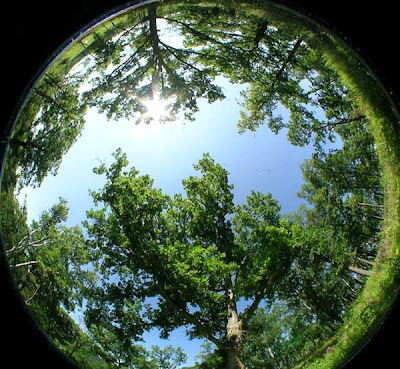 A technique that has been widely used to measure canopy in plant ecology is photography with a fish-eye lens. Tom Givnish of the U.W. Botany Department generously let me use one of his digital fish-eye lens cameras. Over the past few weeks I used this lens to measure the canopy cover of all my purple milkweed sites. The kind of image you get with a fish-eye lens is shown in the photograph. At each site I took images and then quantified the percent canopy. There is some fancy software you can buy that lets you do fairly sophisticated analyses, but my interests were much simpler. I created a digital grid that I could place over the image, and then at each grid corner I recorded whether it was touching vegetation or open sky. My grid was made so that I had about 100 points across the fish-eye lens image. The data I obtained are given in the table below. Each code number (AP-8, etc.) stands for a purple milkweed site that has been permanently marked. I think the data are pretty good, and the results are reasonable. The purple milkweeds do best in areas of around 50% canopy, which is fairly typical savanna habitat. Purple milkweed (Asclepias purpurascens) is an Endangered Species which I have been studying extensively. The goal is to develop conservation methods to permit its establishment at new sites and get it spread more widely. Purple milkweed is primarily a savanna species and this is where we have it at Pleasant Valley Conservancy. It first "popped up" in 1999 after our first savanna restoration work. Since then, as we have continued savanna restoration across the Conservancy, more locations have arisen. We now have 12 separate populations that have arisen spontaneously, in both bur oak and white oak savannas. One of my focuses has been to raise purple milkweed plants in the greenhouse for transplanting at other places. Although these milkweeds are fairly easy to raise, getting good seed has been a problem. Despite good flower formation, often only a few pods form. The reasons for this are not clear. Every year I canvas the area for pods. This year I had great flower formation but very few pods. Some pods started to form, and then aborted. The growing pods just shriveled and disappeared. Probably this was because the flowers were self pollinated. Research on other milkweeds has shown that for good seed set, cross pollination is necessary. The pollinator insect, a butterfly or bee, must pick up the pollen sack at one location and then fly to another and deposit it. Since this transfer is all very chancy, it is easy to see why pod formation might be low. The photo here shows a good pod that is forming this year. Provided it doesn't yet start to shrivel, and the milkweed bugs or weevils don't find it, I should get quite a few seeds from this pod.